Exciting savings for your clients and their employees: from November 1 through March 31, eligible employees get an Extra $40 to spend on Calvin Klein and Cole Haan frames. No extra paperwork, no hassle, just fabulous frames. 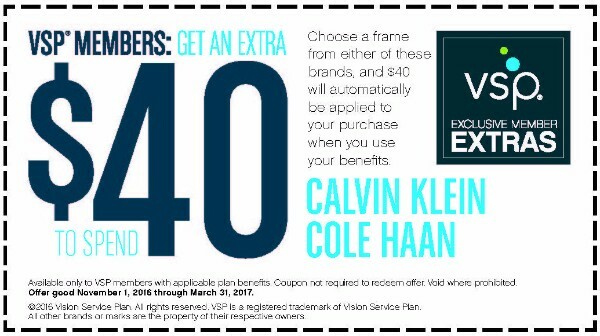 The extra $40 is automatically added to the current frame allowance by their VSP® doctor when they select an eligible frame brand. Pass the great news on to your clients and urge them to take advantage of this limited time promotion.